Sorghum is a small circular grain that is often referred to as the traditional grain of India although it originated in Africa thousands of years ago. Popular in geographic areas that can be prone to drought, sorghum is hearty and has a chewy texture making it a staple grain in India and Africa. The flavor is neutral although some varieties are slightly sweet which allows spices and seasoning to shine through in a dish. In the west, sorghum is more often cooked and then added to soups, salads or used as an alternative to rice in recipes although more recently sweet sorghum flour has become a popular ingredient in gluten-free recipes. High in protein (8-10 grams per 1/2 cup dry), fiber (10 grams per 1/2 cup dry) and a great source of iron, sorghum is a gluten-free whole grain that is traditionally eaten with the hull thus retaining most of the nutrients. 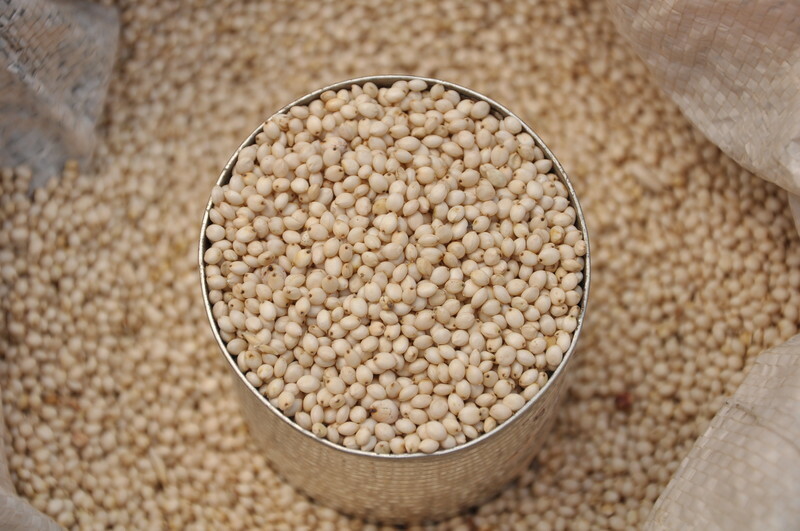 Similar to couscous in appearance, sorghum is small and round with a dark dot making it look somewhat like a tiny pale black-eyed pea. When cooked, the grain retains a gentle firmness and lends a heartiness to soups, salads, and vegetable dishes. To cook, rinse one cup of sorghum and place in a pot with 3 cups of water. Bring to a boil, cover and reduce the heat to maintain a light simmer. Cook for approximately 50-60 minutes until tender. Drain excess liquid and proceed to use in a soup or a pilaf or a salad that calls for the addition of grains. Cooked sorghum is also delicious mixed with grilled or sautéed vegetables (i.e. mushrooms, broccoli, onions, eggplant, zucchini, etc) and a perfect side dish. Sorghum is available at most health food stores and can also be purchased on-line through www.bobsredmill.com where a 24 ounce bag is $3.30, or through Purcell Mountain Farms (www.purcellmountainfarms.com) where a 1 pound bag is $3.75, a 3 pound bag is $6.95, a 5 pound bag is $11.95 or a 10 pound bag is $19.95. Sweet sorghum flour is available under the Bob’s Red Mill label and can be purchased at the company website or through www.vitacost.com for about $3 for a 1.5 pound bag.